Put the yeast in the water and add one tablespoon of the sugar. Stir it in, then let it sit and foam for about fifteen minutes. In the meantime, add the remaining tablespoon of sugar to your lukewarm soy milk, and stir in the margarine and salt. When it's mixed fairly thoroughly, pour in the foamy yeast mixture. Mix it all up. Start adding flour a cup at a time. You should be able to mix in the first two cups with a fork, but on the third cup start using your hands. You might want another fourth cup if the dough is at all sticky. You want this to be a springy, easily-handled dough that can now be kneaded on a floured surface. Keep kneading it until it is smooth and elastic. Grease a bowl and sit the dough in it. Cover it with plastic and put it in a warm spot to rise until doubled. It takes about 2 hours at the most. When it's risen, punch it down. Have ready two greased 9 x 5 loaf pans to put it in. Divide the dough in half and form each half into a smooth oval lump, with the "seam" of the dough on the bottom (you don't want to handle it too much to get all the creases out, so just put them on the bottom). Let the pans sit in the warm spot again, covered, for about 45 minutes. Preheat the oven to 375º F and put the loaves in. Bake for around 30 minutes. When ready to remove from the oven, have ready a wire rack on which to turn the bread out. Stick a knife down the side and lever a loaf onto the rack so you can see its bottom, and thump it with the knife. If it sounds hollow, the bread is ready. If not, return to the oven for about five more minutes. The loaves should cool on the wire rack out of the pans. 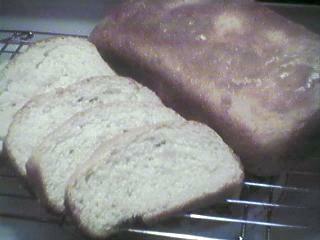 This bread is light and very visually appealing, and it comes out of the pans with no mess at all! Have a slice with jam or honey.